Today on homify 360 we take a tour to an ultra-modern home that is not only contemporary but also enjoys a harmonious relationship with the environment! The stylish villa has been perfectly integrated into the surroundings and has even included the presence of a massive tree into its design as a means of privacy. The home was designed by the wonderful creative team at Mioconcept Architects, who took on the challenge of creating the perfect home with style and function in mind, making both the interior and exterior a true masterpiece! This work of art has all the makings of a comfortable home with the simple use of colour and concrete brickwork to create a home of peace and tranquillity. The exterior grounds boasts enough space for a few cars just in case the inhabitants are in the mood for a fun dinner party with family and friends. The neutral use of colour has allowed this home to look stylish regardless of the season and will be a timeless and tasteful addition to the neighbourhood for years to come, while the single wooden door is the gateway to the fantastic interior… up next! 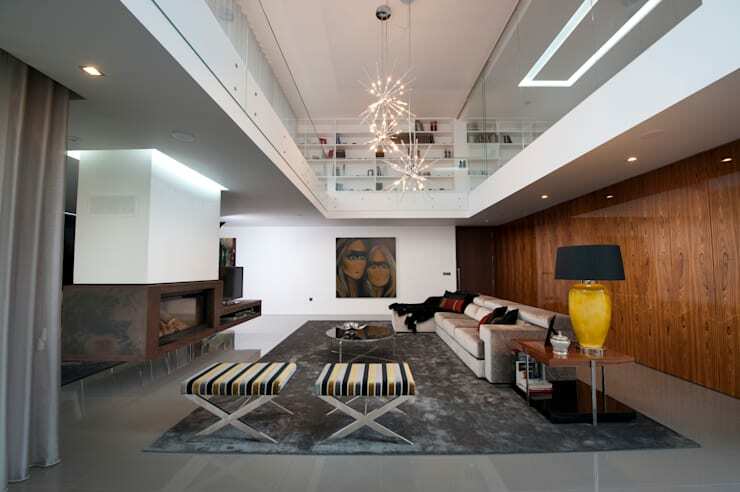 This living room space is nothing less than utter comfort and the devil is certainly in the detail here! 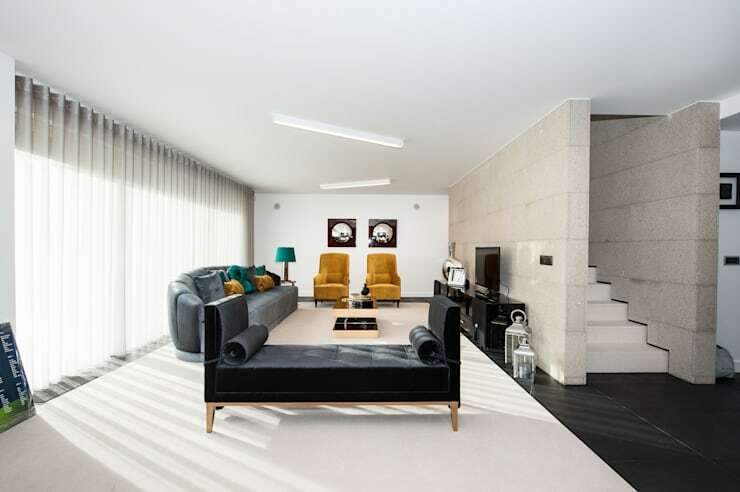 The luxurious carpet allows for total and complete relaxation and refinement, creating a tranquil and comfortable space for guests and inhabitants alike, while the large sofa certainly emphasises that thought. The ottomans are modern while remaining stylish too and the yellow lamp definitely adds a fantastic contrast to the interior, making the room come together in a wonderful and appealing manner. Completing the design and decoration is the modern fireplace in dark brown which will certainly provide some warmth on those chilly days. For more warm thoughts, check out these: Tips To Create A Really Cosy Living Room. The TV room is the perfect place to sit back and enjoy your free time, whether it be watching your favourite show or reading a good book this space is ultimately all about relaxation. The first thing about creating a comfortable environment is to ensure that you have a comfortable sofa, this one included here in dark blue is absolutely heaven. The room certainly has a theme going with its dark blue and mustard yellow decor creating a fun and vibrant appearance, while the floor sweeping curtain is in a neutral tone and allows natural sunlight into the room maintaining privacy of the inhabitants as well. How about that black chaise lounge? Isn't it the ultimate stylish addition to the room? 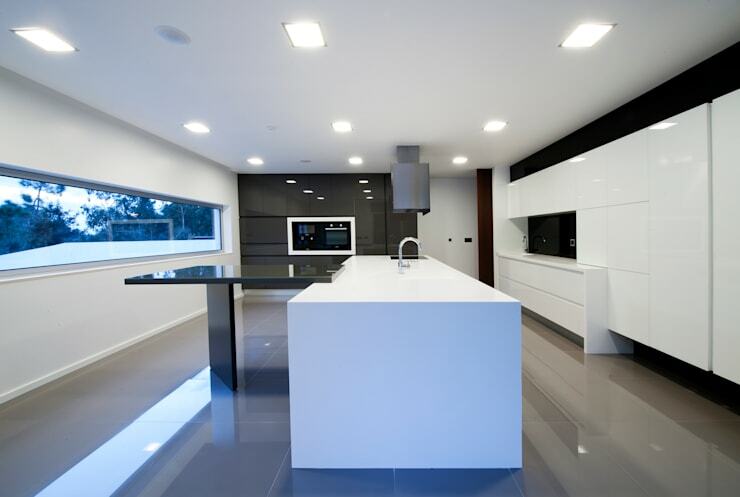 A modern kitchen may not be everyone's cup of tea, but we certainly need to stare at the originality of this sleek and well-illuminated designer culinary space. The all-white cabinets and glossy counters are absolutely attractive, while the inclusion of a work space in the centre of the kitchen makes gourmet cooking quick and easy. The centre-island has a tap for the convenience of the cook, while the modern appliances are embedded in the walls. The large horizontal window will definitely bathe the room in natural sunlight and fresh air throughout the day, making the kitchen comfortable too. This bathroom is very different to the conventional idea, the colours are an assortment of new age designer appeal along with classic yet rustic idea, the all-white fixtures and faucets are timeless creating that ongoing modern edge, while the black floors are something really different for a bathroom that is not monochrome in its creative appeal. 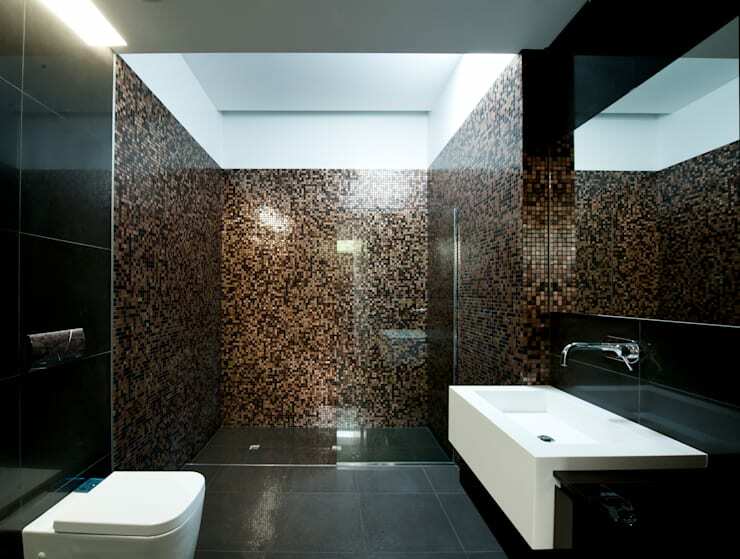 The almost chocolate brown colour mosaic tiles just adds a completely different edge to this bathroom making it original and stylish with a sleek look and feel. Something truly contrasting to the ordinary! 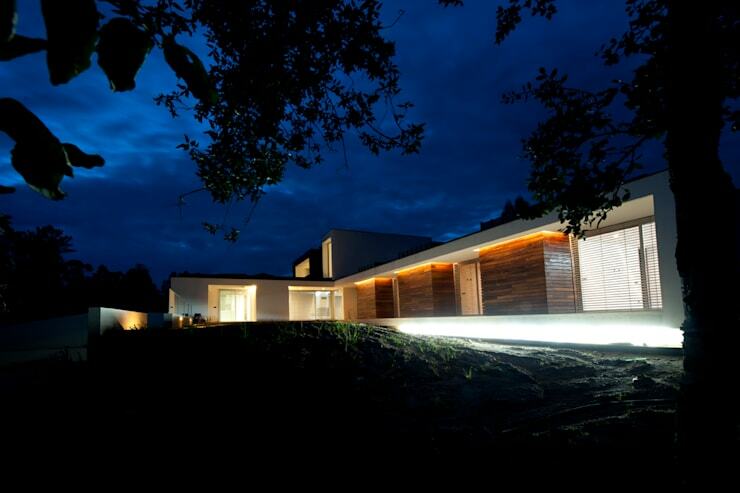 At night, this home takes on a totally different persona, one where elegance and inclusion of the environment can be fully appreciated! The well-illuminated exterior and modern yet stylish design creates the perfect space for the garden to be enjoyed well past sunset. The different materials used in this home allows for the space to be comfortable, while remaining a classic design for a number of years, who wouldn't want to enjoy the cool evening air from the comfort of their home surrounding by trees? It's excitingly eerie! 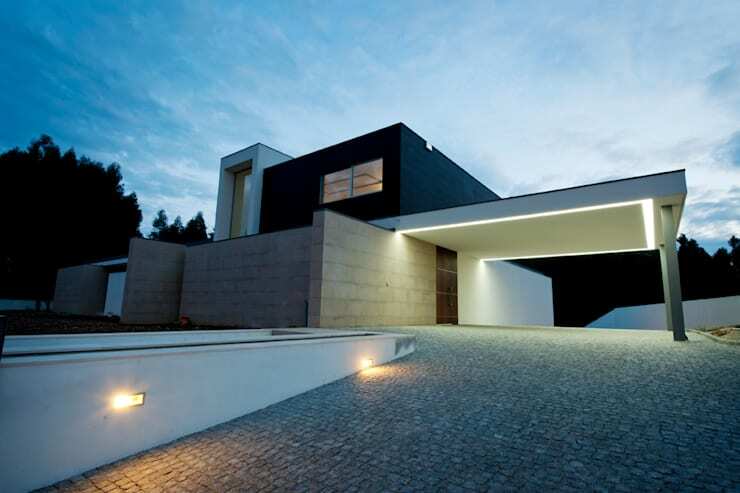 This modern villa is truly fantastic, don't you agree? Please share your thoughts with us in the comments!